The Sequoia Grilling Cabinet features grill island components that may stand alone as a functional outdoor kitchen, or it may serve as a module that you add other components to, like the Sequoia Refrigerator Cabinet, or the Sequoia Double Shelf Cabinet. 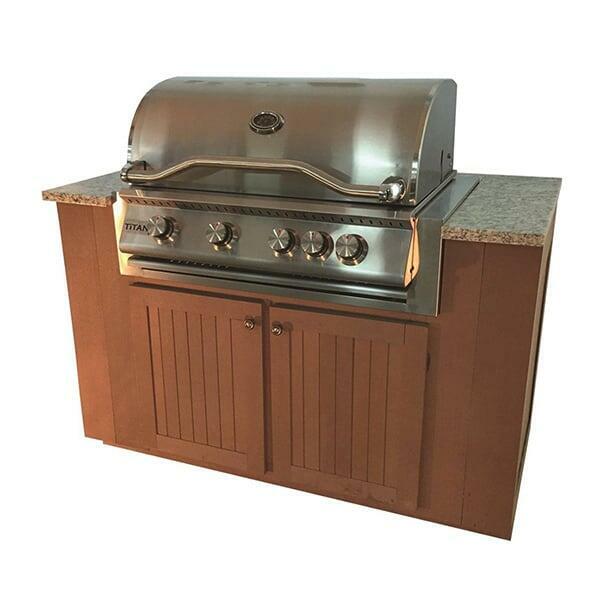 When you choose modular grill island components by Bay Pointe Outdoors, it’s possible to design and build a customized outdoor kitchen that suits the exact needs of you and yours. The Sequoia Grilling Cabinet includes double doors that open to house storage space, plus upper countertop space for food preparation, plus a central 304-grade stainless steel outdoor grill that is built-in to the module. Are you looking for a grilling island that will meet your needs for a lifetime of use? Consider high quality, low maintenance options like the Sequoia Grilling Cabinet from Bay Pointe!